In accordance with the Federal Motor Carrier Safety Regulations each Motor Carrier shall maintain a driver qualification file for each CDL truck driver it employs. Elite HR Logistics can qualify your commercial truck drivers for you so you can concentrate on your customers. Our staff is experts in the field of driver qualifications. Your organization can provide Elite HR Logistics with your application or Elite HR Logistics can provide you with the proper CDL Driver Qualification from Elite HR Logistics paperwork for the employment process. Elite HR Logistics will fully qualify your CDL truck driver to DOT regulations. Elite HR Logistics will also provide you with the required federal and state documentation for employment process and provide a complete file to you. We provide premier opportunities for truck drivers in California. We lease out commercial truck drivers to local and statewide companies who are in search of professional truck drivers. Our goal here at Elite HR Logistics can qualify your commercial truck drivers for you so you can concentrate on your customers. We have a qualified staff comprised of people who specify in truck driver qualifications. These staff members will screen all of the potential candidates to ensure that their license and qualifications meet the needs of current FMCSA/DOT regulations. At CDL Driver Qualification from Elite HR Logistics, we will also provide you with the required federal and state documentation for the qualification process and provide a complete file to you. What’s great about choosing Elite HR Logistics is that we do all of the initial work for you. All you’ll have to do is set up the work for the truck driver and make sure their deliveries are made on time and in a safe manner. Within the DOT application, there are many categories for the candidate to fill out and this will help make your hiring decision much easier. Thank for you visiting our website. Please browse the site for additional information on our services. We will provide you with a complete list of potential candidates to choose from. Should you have any questions or concerns, whether as a driver or client, please contact us today. We’d be happy to set up a consultation with you to discuss how our services will meet your needs. We look forward to hearing from you. CDL Driver Qualification from Elite HR Logistics will ensure that you have all the required documentation for employing the driver. With many people losing their jobs and having a hard time locating work, it makes for a tough economy for those who are unemployed. Do you have a specific skill and can’t seem to find work to match your qualifications? Here at Elite HR Logistics, we provide opportunities for truck drivers in California through proper CDL Driver Qualification from Elite HR Logistics. We guarantee your placement through CDL Driver Qualification from Elite HR Logistics with a top business looking for commercial truck drivers. You’ll always have work and paycheck when you choose Elite HR Logistics to handle your qualification needs. 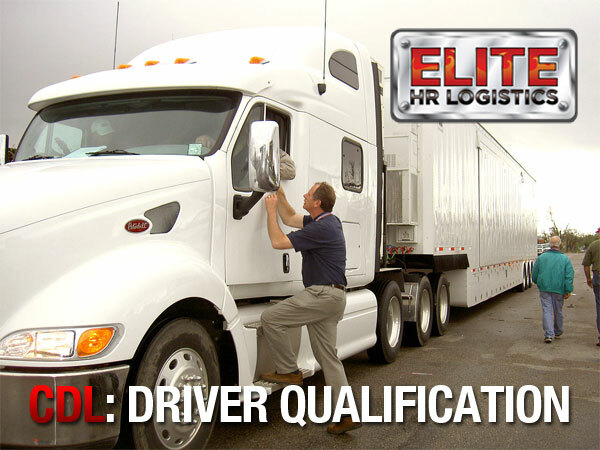 With Elite HR Logistics CDL Driver Qualification, you can rest assured.